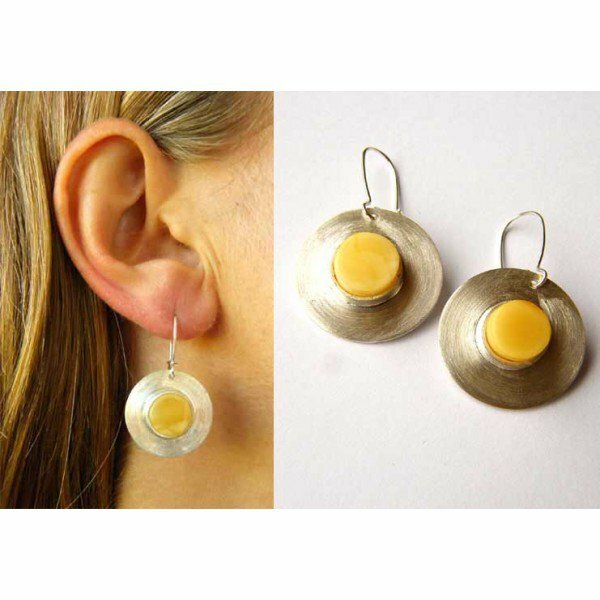 Exclusive in Australia to the Gallery Shop, Skaba jewellery is handmade, designed and created by two Polish artists: Aleksandra and Luke Jozefiak. Luke specialises in Baltic amber. As a third generation artisan, he has perfected his skills to make his creations unique. Aleksandra’s background in Architectural Design is reflected in her work which is characterized by minimalism in form and simplicity of expression. Together their work is natural, simple and fresh. These yellow amber 'hat' shape drop earrings feature genuine Baltic amber and sterling silver. Please note that earrings are not returnable due to health and hygiene regulations.